Poori is a deep fried Indian bread commonly consumed as breakfast or sometimes as a meal accompanied by Aloo Subzi (Potato gravy). 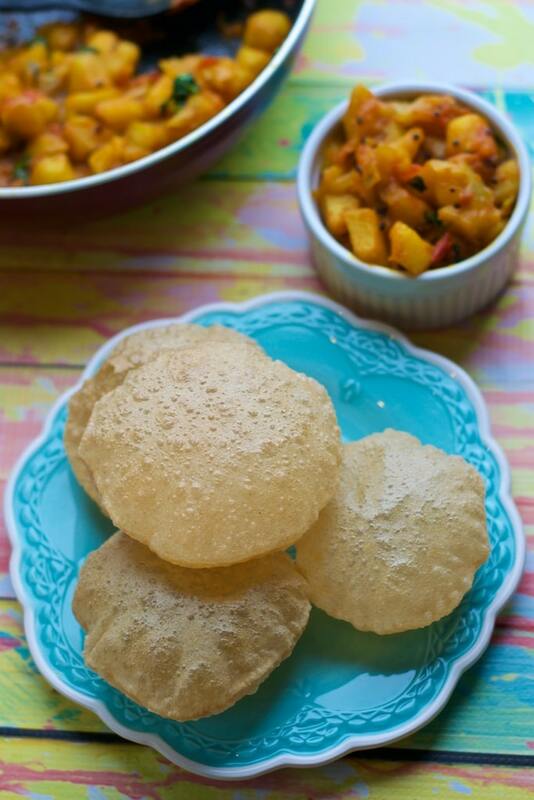 Here’s a recipe to make those puffed up pooris that we all love! For me, Pooris bring back a lot of lovely memories from my childhood. During our summer break, we would start our day with going to the garden behind our apartment building and plucking flowers before the elderly men or uncles (as we used to call them) living in our building would come to get flowers for their daily prayers. Yeah, we were sneaky little kids :D, we had to be because they would yell at us if they saw us anywhere close to their precious flowers. Once the flowers were plucked, we would rush home, take a shower, quickly offer our prayers and the flowers to our deities and wait patiently, as our mom made Pooris for us and served it with Shrikhand. I clearly remember between the two of us (my brother and I), we could easily eat 10-12 Pooris. Those were the good old days! You could eat and eat and not put on an ounce. Flash forward to today, my husband (who is more health conscious than I am ;-)) will not eat anything deep-fried so we don’t deep fry much at home but every once in a while when we indulge in Pooris, it makes me feel like a kid again, without a care in the world. Some tips to make Pooris puff up every time! Dough softness – The dough should be firm and not soft like the ones you make for Roti. Cover the dough and let it rest for 30 minutes before you roll out the Pooris. Rolling out Pooris – Roll out only 5-6 Pooris at a time, fry them and then roll out the next batch. This prevents the rolled out pooris from drying out. Also, once you roll them out transfer them onto a greased plate. Do NOT use flour while rolling the Pooris if they are sticking to the board. Dab them with a little oil as needed to prevent sticking. Poori thickness – When you roll out the Pooris, they shouldn’t be thick for sure but not very thin either. Look at the video (below) to get an idea. Oil temperature – If the temperature of the oil is too hot, the Pooris will brown quickly and it won’t puff up if the oil is not hot enough. I start with heating the oil at high and then add a small piece of dough. If the dough rises quickly to the top, I know the optimal temperature has reached. Reduce the heat to Medium-High and start the process of frying the Pooris. Making the dough: In a large bowl combine wheat flour, 2 tablespoons of oil and salt. Add water to the dough, few spoonfuls at a time and knead well to make a firm dough. Add one teaspoon of oil to the dough and knead again. Cover and set the dough aside for 30 minutes. Once rested, knead the dough again and divide into approximately 20 pieces. Make them into balls. Heat the oil: Heat oil in a deep kadhai or wok kept on high heat. Meanwhile, start working on rolling out the Pooris as the oil heats. Frying the Pooris: Drop a small piece of the dough in the oil. If it rises up immediately, the oil is ready. Slowly slide the Poori in the oil and it will immediately start to puff up (If it does not, pour the hot oil from the wok/kadhai on top of the Poori using a slotted spoon). Fry them for 10 seconds or so and flip them to the other side. Let it cook for about 10 seconds and then drain the Poori off the excess oil using a slotted spoon. 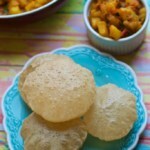 Transfer the Poori onto a plate lined with paper towels to absorb any excess oil. Repeat the process for the remaining Pooris and serve them hot with Shrikhand or an accompaniment of your choice. I have included the nutritional info for Poori from Myfitnesspal as an example and I can't vouch for its accuracy since I am not a nutritionist or dietician. For a homecook it is difficult to calculate the nutritional info for deep fried foods. Loved this recipe? Check out my posts on how to make perfectly soft rotis and soft idlis. Your website and recipes are incredible! It’s amazing to see easy to follow authentic recipes that don’t involve high-end produce. My boyfriend and I are loving paneer after discovering it through subscribing to a ‘Simply Cook’ package. We would like to be able to make the amazing recipes we’re sent but without the subscription (it’s expensive) – Our favourites being Palak Paneer and Chicken Makhani. What would you say are the bases to any good homemade makhani? Hi, Kaitlinn – check out this curry sauce recipe. I am sure you will love it – https://simmertoslimmer.com/easy-indian-curry-sauce-recipe/. It teaches how to make the basic curry sauce and how you can create different recipes from it. If you have any questions, I would be happy to help!